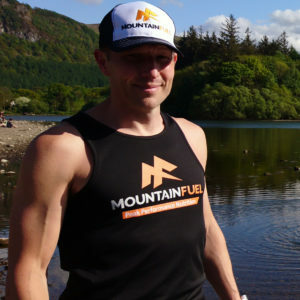 Mountain Fuel is a total Sports Nutrition system designed to provide the body with the energy and replenishment to cope with any type of intense physical activity. 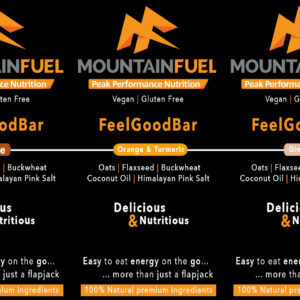 All the ingredients in Mountain Fuel are ‘food’ based and do not feature on the WADA list of banned substances. If you require batch tested products please contact us. Having just attended a nutritional lecture I was pleased to discover that Chocolate Milk was an ideal drink for that golden hour straight after a race or a hard training session – this means I can buy more of this incredibly tasty and nutritious recovery aid guilt free. I have used many other recovery products over the years but this is the most effective, easy to use recovery drink I have ever used. It is great tasting, easy to mix and refuels the body- best of all is the natural ingredients. I know when I haven’t used this for events or long training sessions, never thought I would say that a product is so effective at fueling athletes and tastes great. Given it’s natural ingredients gets another tick in my box and like the other reviews have never suffered gastric issues experienced with some energy products out on the market. Chocolate recovery is an absolutely delicious way to end a run, combines really easily, no lumps easy to drink…. love it !! 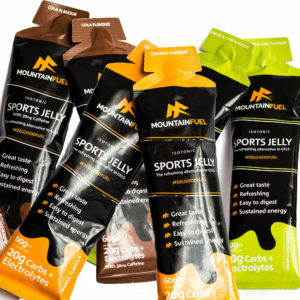 having tried lots of other energy fueling products i was a bit sceptical when someone told me from my running club to try extreme energy mountain fuel. I am glad he did as it is the best on the market and i am 60 and have been running for 45years i suffer with cramp on long races but mountain fuel has cured this, i would definately recommend people to try this product.Paul. Summerly. 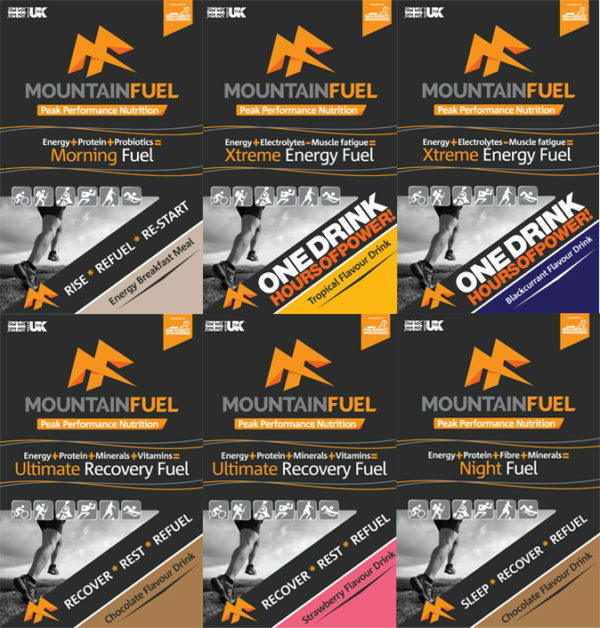 Morning Fuel is probably my favourite Mountain Fuel product as it’s so versatile. Pancakes, homemade ‘gels’, mixed with whatever else I fancy for breakfast or just on it’s own. Definitely my go to pre-event breakfast and, as others have said, a great pick me up during longer races. Great value. All the flavours taste nice. Used for half marathons and an ultra. Would order again. Great product, finally said goodbye to gels this product works and tastes great go for it!!! Love this, great taste and really helped me to recover well, felt great all afternoon after my long run having this product best on the market. Fantastic bundle for an extremly good price! As someone who does many events per year, from 10K to Marathons, OCR to gymnastics, I couldn’t recommend any other product. Great fuel for long days out in the fells and trails but at the same time ideal for shorter stuff. I drink it an hour before my local Parkrun and am now running faster times than before. I carry a soft flask of it for longer runs and feel so much better than when I used gels, no crashing and no more dodgy tummy! Great value too!! Have been using this product now for over a year, as well as all their other pre and post products, absolutely love this, delicious night time drink sipped slowly before bed, ready fuelled for the race the following day. Cant recommend this and all their products enough, have gotten me through some tough mountain runs and loads of Obstacle Course Races. Everything just mixes well, tastes great and has every ingredient required to fuel your body the right way. When out and about the night fuel is the only (hot) chocolate drink I use. From sitting around to moving about. It really does set you up the next day. Started using Mountain Fuel in my long hill runs in preparation for UTMB 2016. Tastes great with no issues at all (in terms of the usual nausea). Seemed to provide a constant supply of energy too and helped my avoid using the dreaded gels in the race itself! Wish they had a few more flavours though for the really long runs! Really impressed with the extreme energy, have been using all year and no coincidence that I have eliminated DNF’s that had been attributed to stomach issues in the past. This year I used on the lakeland 100, Kielder 80km, Triathlon X Ironman and Brutal Ironman and knocked a significant amount of time off my Trail marathon P.B. and set my road marathon P.B. I only drank M.F. Xtreme and avoided solid food so no stomach issues on the shorter runs. Would recommend the recovery powder as well. I use mountain fuel for all of my races. It has helped keep me going on many occasions. totally fantastic product..it tastes so delicious ,I cant wait to finish training to have my recovery drink. First time using Mountain Fuel so thought I would get the full package and give it a go. The plan was to use it in training for and on the Chester Marathon. In the past I have had issues with gels. Unfortunately I bought a little too late and I only had a chance to try the Xtream Blackcurrant and the chocolate recovery before the event and really did like the taste of both, the recovery drink is the best milkshake I have ever tasted and this is from someone who really does not like chocolate milkshakes. Come the night before the day of the race I tried the overnight fuel and again another wow, really chocolaty. In the morning I got up and tried the morning fuel, a little too sugar for my taste but it did well, I filled my bottles with the tropical Xtream and set off for the long drive to Chester. It was only my second Marathon with my first being the Dark Skies in March with a time of 5:15. I was sensible even though my training was saying just over 4 hours and went with the 4:30 pacers (cracking pair of gents). All went well with the drink mixed with a chunk of trek bar (sorry I know they are not yours) every hour and water every 5k, I did have an issue at mile 20 (who doesn’t somewhere on the marathon) and I got to the end wishing I had taken the other Blackcurrant Xtream as I really do prefer the taste I was more than happy with my time of 4:32 (two toilet stops..sorry too much information). When I got back to the car I mixed up my Strawberry recovery drink and was a tad disappointed that it was not as good as the Chocolate one but again that was down to personal taste and not the product. In regards to does this stuff work I can honestly say I was out on Monday for a 5k so I must have felt good, it was not quick but I was out. I’m looking forward to a few more marathons next year with maybe something a little longer very soon, all powered by Mountain Fuel. A shaker bottle would be more use than the Sports Bottle but other than that and the taste of a couple of bits I’m a really happy boy with not feeling the long run effects that I had from gels in training. 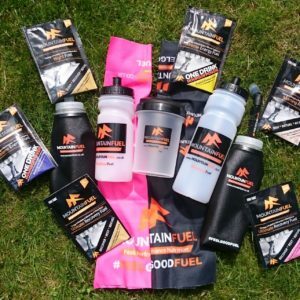 I honestly believe you can not get a better start to your race/training day.The morning fuel is my favourite product,I’m so happy I discovered the mountain fuel range. The thing about these energy drinks is that after the first hour they make you gag. Not so with Blackcurrent Xtreme Energy Fuel. When you’re half way round the Lakeland50 and feeling crap this stuff still tastes great. Run or ride, my ‘go to’ nutrition. I’ll be honest I am not a supplement or sachet kind of gal! On my ultras I like real good food like scotch eggs and sausage rolls and flat coke but I was given a sachet at a lakeland recce. Like a lot of freebies it sat in my ultra tub of rubbish and I never got round to using it. I’d heard good things about this stuff and if Lakeland race was happynto have its name agaibstbit I trusted their judgement !!!!! So at just £12 for the taster pack there was no harm in trying it !! Well I am converted !!!! I tried it one weekend where I had a marathon on saturday and a 26 mile lake recce Sunday and used the night time breakfasts sachets before both and then the drinks on route and the recovery after. I found I didn’t need any other food or intake on both races and felt amazing and performed well. I even recovered better than ever had before with no post event energy dip and much less doms!! Thought it may have been fluke so tried it again in two more ultras the same regime and it bore the same results !!! No fluke !!! One more ultra to go this year in the lakes and no prizes for guessing what I will be fuelling with !! I am converted from a sceptic to a devotee !!!!! And asked santa for bulk package deal for Xmas on the products !! Have to say the night time chocolate drink is better than any shop bought or cafe bought hot drink ever !!!!!!! !